Aside from a great view of Mount Fuji, there are plenty of other things to see and do in Yamanashi. Walking around Lake Kawaguchi is a nice experience. 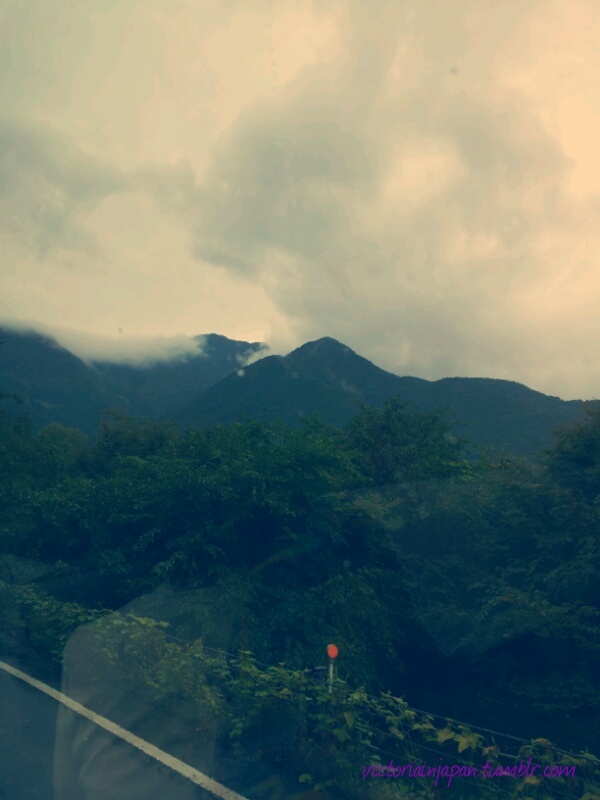 I really did enjoy the views of Lake Kawaguchi and the mountains. I’m sure if you are lucky enough to see Mt. Fuji it would be even more amazing. We stopped at Funatsuya for some Houto, which is a flat udon noodle in a hot pot. It has a miso flavored broth and is great on a cold day. 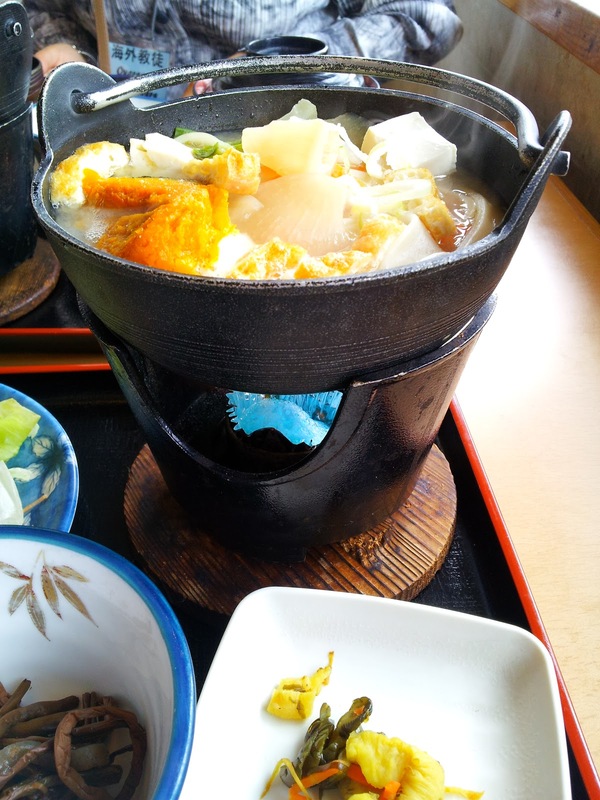 If you are in the area I suggest you try eating Houto as it is famous in Yamanashi. 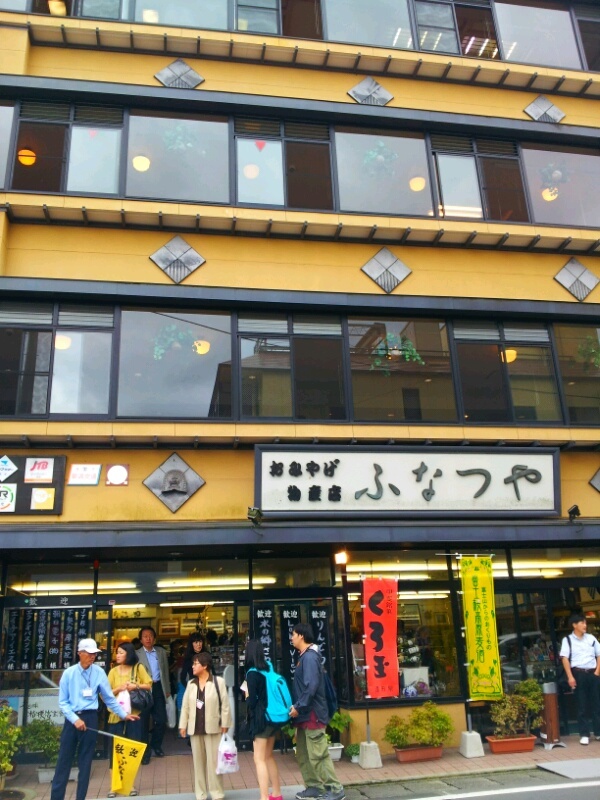 There is a souvenir shop on the first floor, where I bought Kinako Mochi. 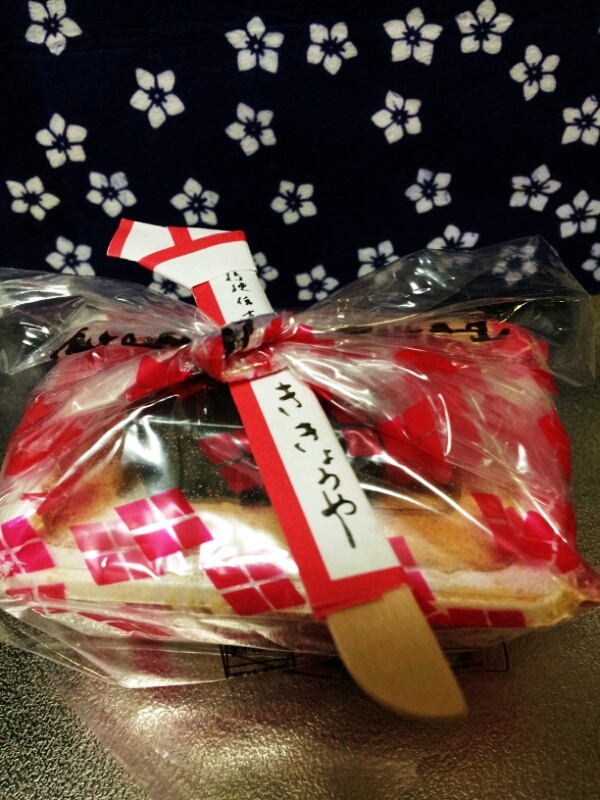 Here is the souvenir that I bought from the Funatsuya Rest House. If you like mochi or mochi with sweet red bean paste, I suggest you give this a try. Kinako is soybean powder. You have to be careful not to breathe in the powder, unless you want to have a coughing fit. 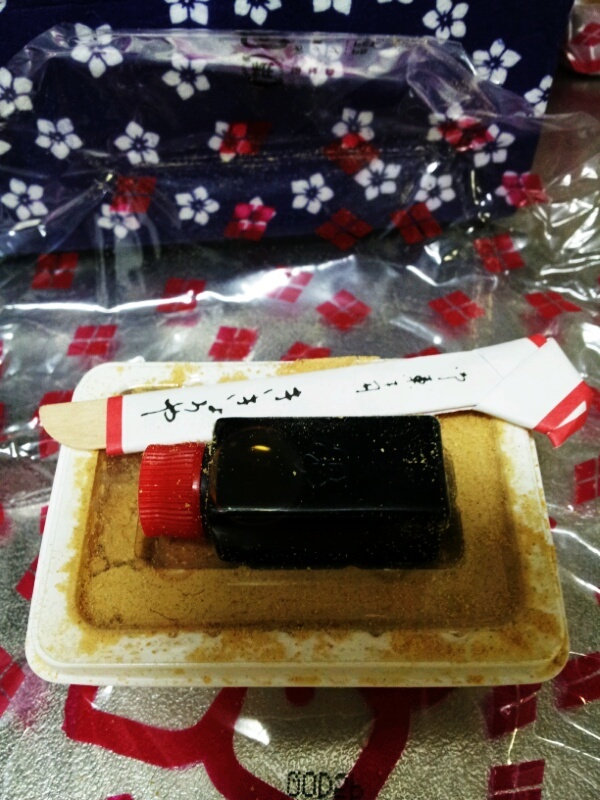 This comes in a bag with mini sets of kinako mochi, brown sugar syrup and a flat toothpick like stick. What you do is separate the mochi pieces, there should be at least 2 cubes, and then pour the brown sugar syrup on top and enjoy! If you like it really sweet you can use all of the syrup, but I don’t so I just use a third of it. I recommend you keep the box on top of the plastic wrap, because the powder does make a bit of a mess. Here is the Houto noodles that I mentioned earlier. As you can see there are a lot of vegetables in the hot pot. 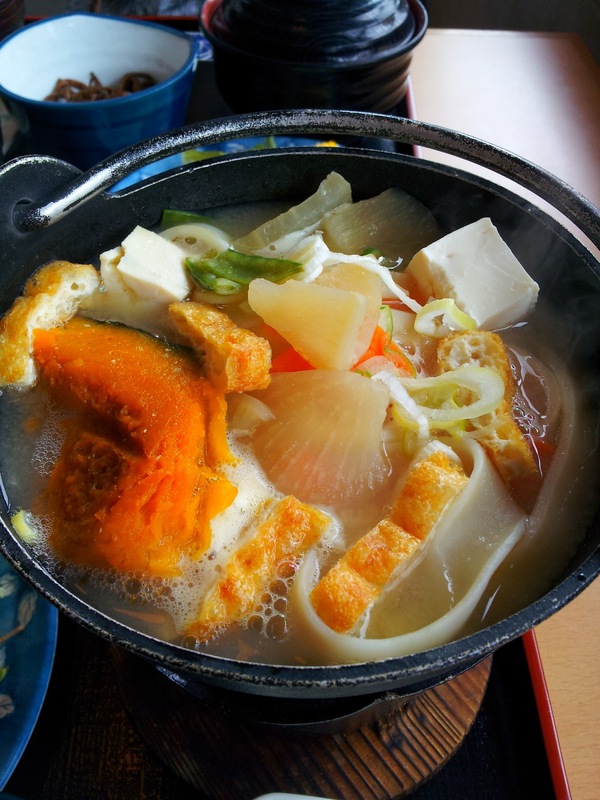 There was a little bit of Japanese pumpkin, Japanese radish, fried tofu, tofu, carrots, green onion and of course we can’t forget the flat udon noodles! For me this was a lot of food. I couldn’t finish the soup, but I did eat everything else. I was so full for a long time. After a hearty meal, we’re off to find dessert. 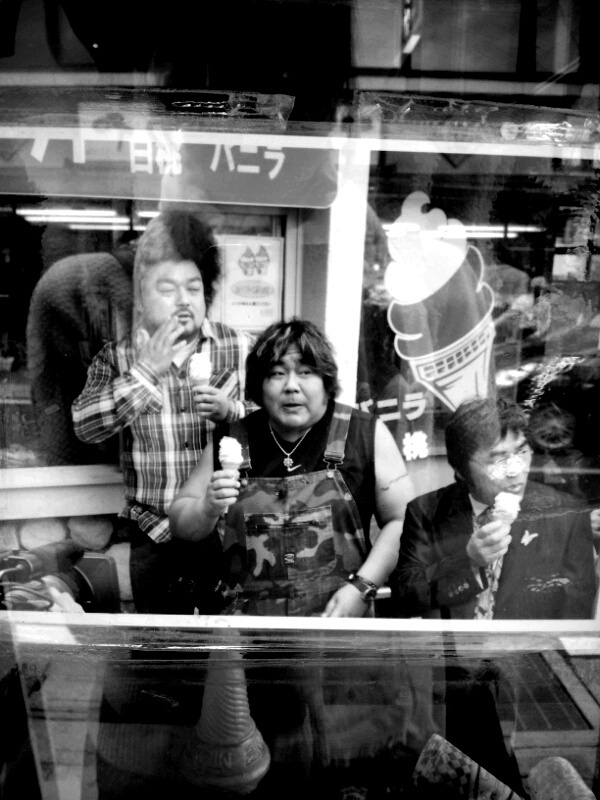 These 3 guys are famous in Japan. I’m sorry, but I can’t remember their names. I do know that the guy in the middle has a show where he goes to different places in Japan to try foods that are famous for being really delicious. His catch phrase is “Maaaayuu!”, which is his way of saying it is very delicious. Don’t worry in Japan his show is a hit and it is very funny when he says it. 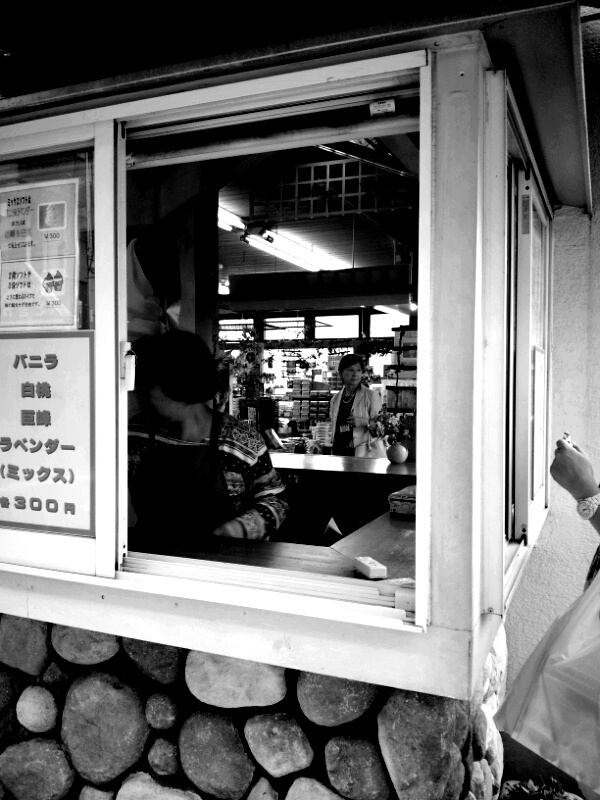 Here you can buy lavender ice cream. I know it sounds really weird, but it actually tastes very good. 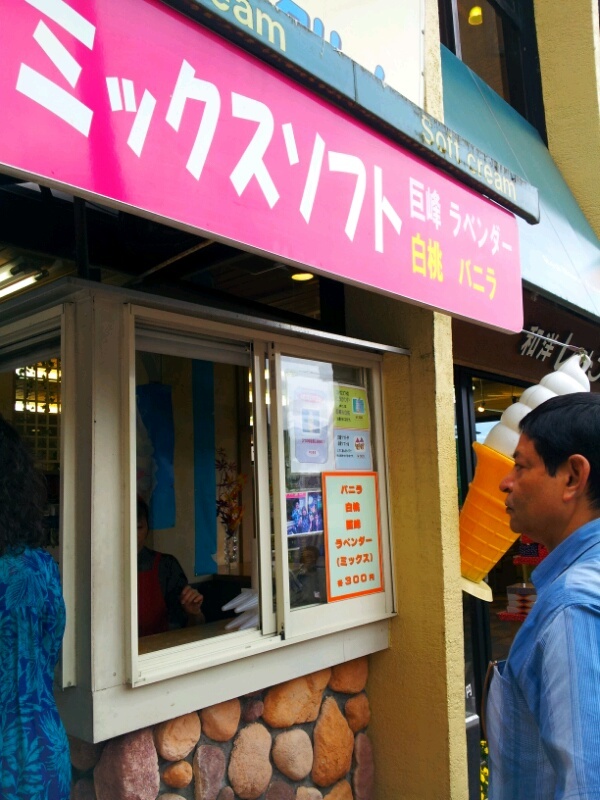 Many people line up to buy lavender ice cream. Of course, they have vanilla and a few other flavors for those less adventurous with ice cream flavors. 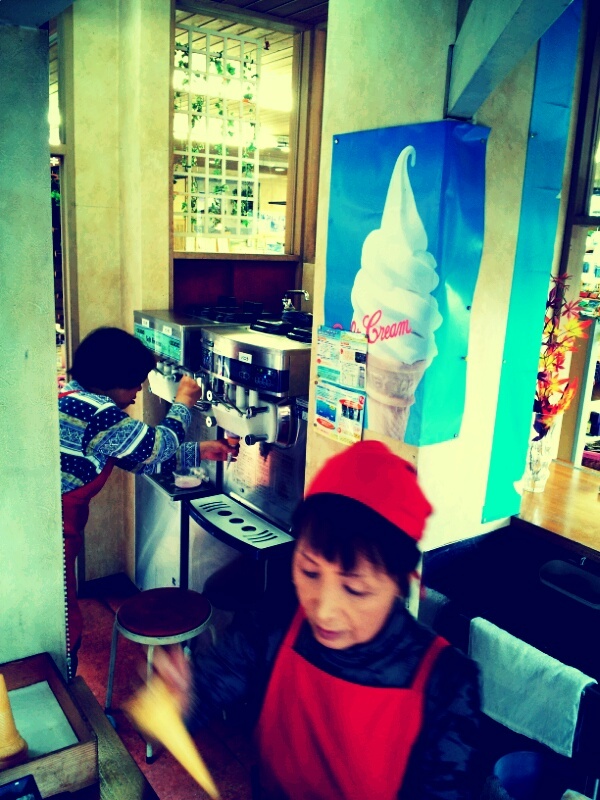 There were 2 ladies working in here since there are so many people that want to eat ice cream. I’m not sure how busy they are in the winter, but then again I think we want to eat ice cream any time of the year…at least I do. I was so full from lunch, so my mother and I decided to share an ice cream cone. We decided we weren’t going to be too adventurous. We ordered grape and vanilla ice cream. Don’t worry the grape flavor wasn’t too strong. It was a very light hint of grape that it was refreshing! All that long walk, taking pictures and sight-seeing could be a bit exhausting. 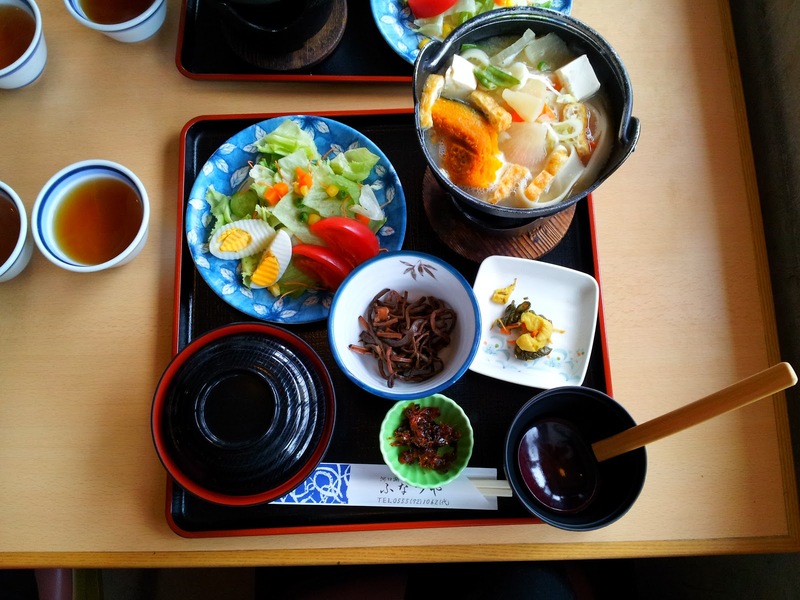 Be sure to try the food at Funatsuya if you happen to visit Yamanashi; and if it’s not too cold, you might wanna try the ice cream. 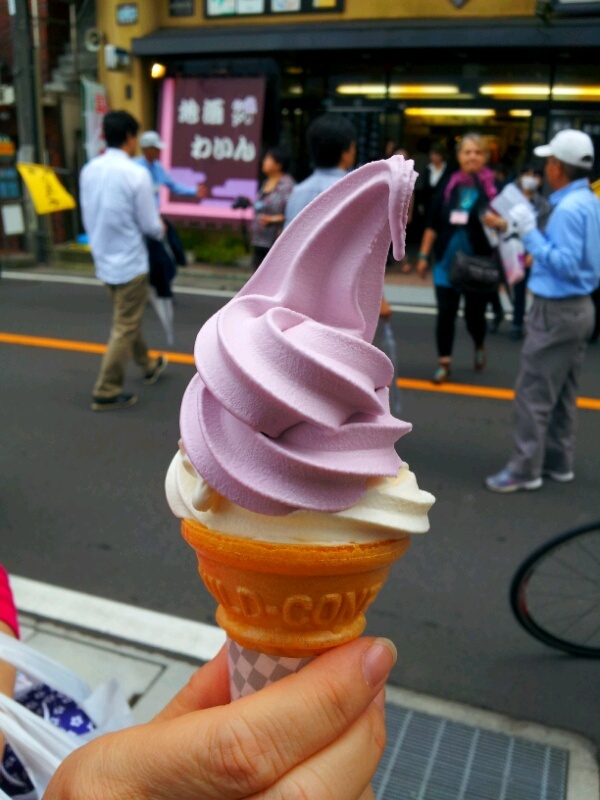 Good article ~ I especially want to try the lavender ice cream now!! !